The Sonova employee engagements play a decisive part in the success of the foundation’s project work. Therefore, Sonova and the Hear the World Foundation reward outstanding employee engagements with the Hear the World trophy. The Sonova employee engagements build next to the financial and the technological support of the projects another important pillar of the foundations work. Therefore, together with the Hear the World Foundation, Sonova started to reward outstanding employee engagements with the Hear the World trophy. The award expresses gratitude and wants to motivate employees to further engage. The employees of Sonova Germany were awarded with the Hear the World Trophy 2017/18. 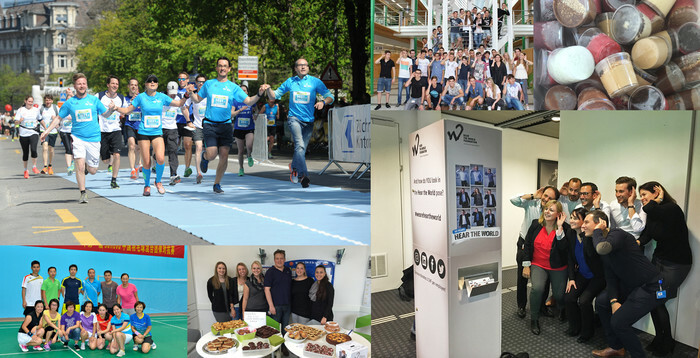 Over the last couple of years they have supported the Hear the World Foundation with various charity events, employees volunteering at Hear the World projects and the active sharing of Hear the World messages. Last November one of their employees travelled to Beirut with Hear the World to provide children with hearing loss with audiological care and at Christmas 2017, 89 employees of Sonova Germany passed on their Christmas present, enabling them to donate 3,204 Euros to Hear the World. The Hear The World Trophy, our internal award for outstanding employee commitment, goes to our colleagues in Suzhou, China, for the fiscal year 2016/17. We would like to congratulate the 886 employees on their achievement. As part of its work to mark the 10th anniversary of Hear the World, the Unitron Zuhou team ran a large number of campaigns, raising over CHF 4,000 for the employee project in India. The winners of the Hear the World Trophy 2016 have developed a modern IT solution for the Hear the World Foundation to handle the annual funding application process. This has significantly simplified the extensive application process for project proposals, as all of the data from the process is now stored in a single system and is accessible from anywhere in the world, facilitating the foundation’s work with its partners worldwide. For the first time the Hear the World Foundation supports an aid project with the donation of cochlear implants. In February 2017, three children with profound hearing loss in Panama received the gift of hearing and thus a fair chance of leading an independent life.